My poor 11 yr. old nephew, Dither was sick since Sunday. He's been vomiting has fever and complained of headache. 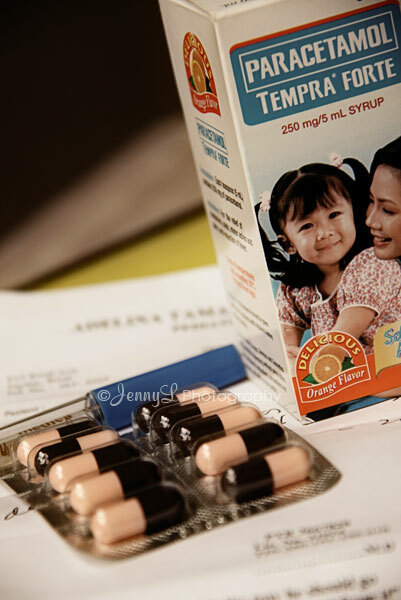 SIL and my bro brought them to his doctor and gave her some medicines for his tonsilitis. Today (tues.) he was not able to go school bec. he is sick again, he has no fever but still got a headache. Poor kid..
FIY, he doesn't like to eat veggies or any meat while eating rice.. very picky! he can only eat rice with soup (SABAW lang talaga!!!) either tinola, nilaga or sinigang.. Dunno what's wrong with him really, if we force him to eat rice with meat or anything he'll throw it up..
Last year, he got sick of Dengue and has 50/50 chance of survival but thank God he survived it. He got so thin that he looks like he's been taking weight loss pills but it is bec. he got really sick. Anyway, with God's graces he went to school already this morning.